Last night was the premiere at the Theatre Royal Glasgow, of The Devil Inside, a co-production by Scottish Opera and Music Theatre of Wales. Although the name suggests an opera based upon the works of INXS, it is in fact adapted from a short story by Robert Louis Stevenson. 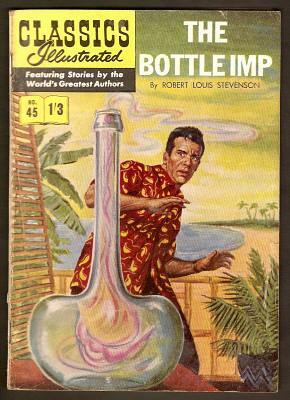 The author of Treasure Island and Dr Jekyll and Mr Hyde wrote the short story "The Bottle Imp" whilst living in Samoa, firstly for a Polynesian audience. Written in English it was first seen in a Samoan translation in 1891, published two years later in English in the collection Islands' Nights Entertainments. The original story, featuring an Hawaiian sailor who buys a bottle containing an evil imp, has been adapted by author Louise Welsh, who wrote the libretto (opera text) for this production. The music is by Scottish composer Stuart MacRae, a contemporary score which is as jarring and unsettling as the story it tells, a good fit. Louise Welsh as an author can tell tales which start off in a familiar world, then quickly develop into a dystopian Gothic horror. Her last book that I read, A Lovely Way To Burn, has the host of a TV shopping channel heading out on a date at the start, and wandering through a post-apocalyptic world of a viral pandemic by the end. 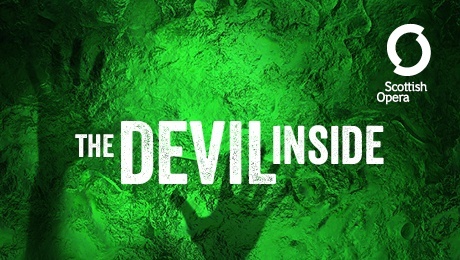 The Devil Inside is performed with a 14 piece ensemble of musicians (partly a practical imperative as the opera will be touring venues of various size after being performed in Glasgow). Stevenson's story has been brought into the modern world. A cast of four performers (plus an almost ninja-like stage crew) tell the story. Ben McAteer and Nicholas Sharratt are young men trekking through mountains when they shelter in a mansion. It is home to a troubled old man (Steven Page) who tells them he got his fortune from an imp in a bottle, which can grant your every wish. However there is a price to pay. If you die in possession of the bottle your soul is condemned to eternal damnation, and the bottle can only be passed on by being sold for less than you paid for it. The price is getting low already and starts to fall further. A simple but effective staging uses shadow theatre. 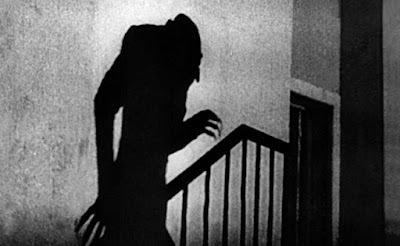 This can conjure up a contemporary world, with the modern cityscape of the young man's wished for property empire, whilst recalling the Gothic terror of the shadowy figure from the film Nosferatu. The story batters along and the acting by all on stage is excellent. Any happiness gained through the imp in the bottle is tarnished by it, and when one of the young men finds love with Catherine, played by Rachel Kelly, illness threatens to ruin their happiness. Clever changes like this from the leprosy Stevenson's sailor developed in the original story all work well in this telling. Temptation brings them to seek out the bottle imp again. The story and acting conveys the addiction of those using the bottle, despite the harmful effects that they see (cf. alcohol, drugs, gambling). It affects all of them in different ways which reflects their personalities and a Rorschach inkblot hangs over them, a test used to assess personality traits. I sometimes struggle a bit with operas sung in English, it just sounds more musical to my ear when you are not listening to the meaning of the words, and just let them wash over you as sounds. So this text, sung in English obviously, has that problem for me. At times it felt like a good play that they were singing to each other. However as the story moved on the music and atmosphere became more immersive and the ambiguities in the ending which the story has been given, gave it a great punchy finale. Well played, well written. Imaginative and absorbing. I was left thinking it through after going home, greedy for more.